Live streaming of sporting events in the U.S. garner a lot of attention from the media for their viewership numbers, but the fact is that these events pale in comparison to what’s going on in places like China and India. 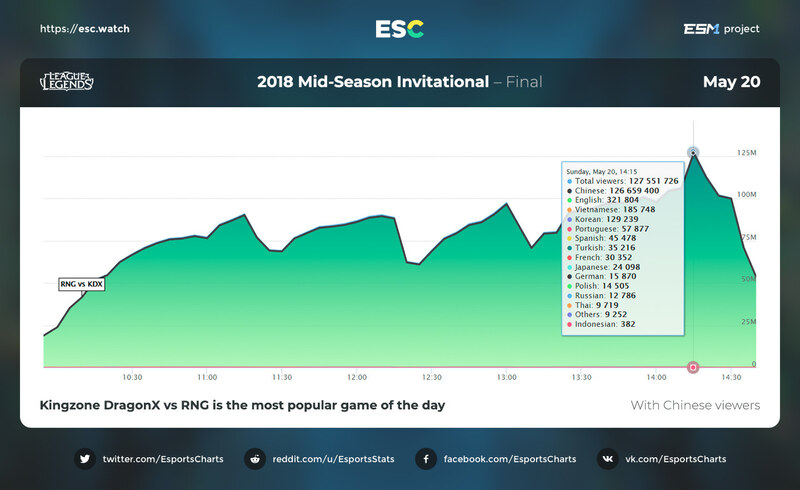 On May 20th, the live stream of the League Of Legends final peaked at just over 24.5M simultaneous streams, with 98% of those viewers coming from China. To date, I haven’t heard of any live event on the web that comes even close to those viewership numbers. For anyone who has read my blog long enough they know I am very skeptical about any numbers put out after live streaming events. Many times the numbers can be generalized or definitions of what “concurrent” or “simultaneous” mean change based on the broadcaster or content owner. So I had multiple back and forth conversations with ESC about the data to confirm their numbers, with them defining simultaneous as “Avg CCV”, or Average Concurrent Viewership. The 24.5M number was the same feed, broadcast across 11 partners including Twitch, YouTube, Facebook and other platforms. But China isn’t the only region seeing some pretty high viewership numbers when compared to the U.S. On May 27th, Hotstar’s live stream of the 11th edition of the Indian Premier League cricket tournament had their stream peak at 10.3M simultaneous viewers. One media outlet called it a “new global record”, which it isn’t, but the fact remains that live sporting events outside the U.S. are seeing much higher number than events primarily targeting viewers in North America. Live streams of sporting events outside the U.S. are now starting to be on par with the kind of viewership you would expect only from traditional pay TV services. And while the quality of the broadcast isn’t the same, for most users, the product being offered online is suiting their needs just fine. Pay TV providers have to be watching these simultaneous stream numbers climbing and wondering how they are going to compete with them in the long run, for specific one-off events.